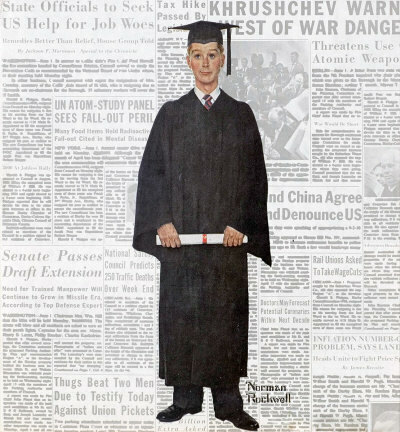 Boy Graduate, a Norman Rockwell painting , appeared on the cover of The Saturday Evening Post published June 16, 1959. This is another timeless favorite of Rockwell collectors, a classic for all the ages. This painting was Rockwell's 306th overall out of 322 total paintings that were published on the cover of the Saturday Evening Post. Rockwell's career with the Post, spanning 47 years, began with his first cover illustration, Boy With Baby Carriage in 1916 and continued through his last, Portrait of John F. Kennedy, in 1963. This was also the third cover for The Post in 1959. In 1959, there were four Norman Rockwell Saturday Evening Post covers published. The original oil on canvas painting, 74.5 x 36 inches or 189 x 91.5 cm, is part of the collection of the Columbus Museum of Art. on page 224 of Norman Rockwell, A Definitive Catalogue by Laurie Norton Moffatt. Pristine original copies of this magazine cover bring good prices on eBay, when it is available. And to think it only cost fifteen cents originally! And it was mint condition then, too. Norman Rockwell uses the backdrop of the newspaper to provide contrast in this painting. The newspaper is just chock full of bad and ominous news. Usually, every newspaper follows this same formula. Rockwell uses this newspaper full of ominous headlines and stories as a counterpoint to the hope of this new graduate. We cannot tell whether he is a graduate of high school or even higher education, nor does that matter. Whay matters is that this young man is starting on a new adventure. He is full of hope, aspirations and ambitions. No amount of scary headlines will keep him from making a go in an increasingly treacherous maze of a world. Nor should it. Boy Graduate was only one of 322 Norman Rockwell Saturday Evening Post covers; Here is the list of Norman Rockwell Saturday Evening Post cover illustrations. Rockwell painted this picture to be lifesize. At over six feet tall, this was one of Rockwell's biggest paintings. He also took a chance with this composition. The stark background against which this boy is starting his adult life was both a gamble and a victory for Rockwell. He was known for his camera eye in painting. He captured every detail of the newspaper and its news as the stark reality into which the boy will be thrown. I would say that the gamble paid off. Do You Have A Great Story, Opinion Or Contribution About Boy Graduate?